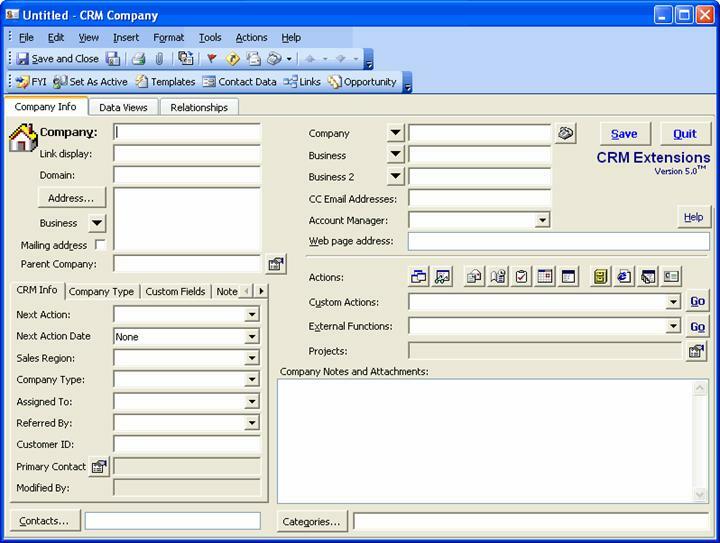 · “CRM Functions” options are set on the CRM Options “*Extensions Forms” tab. · Quick access to specific CRM information related to this Company (Journals, Tasks, Appointments, etc.). 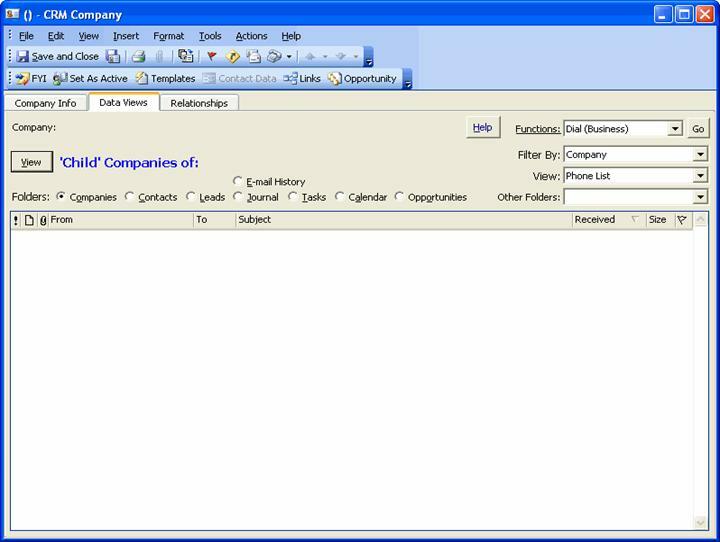 · Filter the displayed list by this Company or the linked “Primary Contact”. · View the information with Outlook Views that have been created in the corresponding CRM public folder. Display any field, four levels of sorting and grouping, and more. (Ex. Clicking “Calendar” will display all Appointments related to this Company). · These Views are dynamically user configurable right on this form, just as with views in any Outlook folder (click a column title to sort, drag/drop grouping, add fields, etc.). · “CRM Functions” options are set on the CRM Options “*Extensions General” tab. · Establish unique relationships between your CRM Company records. · Picker button makes finding and selecting the company easy and quick. · View the related CRM Company by clicking the company link. · Define the type of relationship between this company and the linked company. · Being able to establish additional relationships within your CRM data can be essential to quickly accessing your data. · See also the "Parent Company" type linkage on the first tab to track and view all CRM data related to the Parent Company.